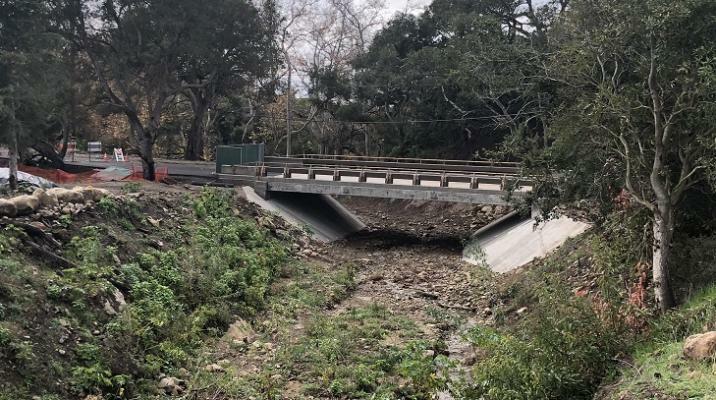 Caltrans is continuing to rebuild and repair six bridges along State Route 192 following debris flows and flooding in the Montecito area last January. Caltrans is working to restore full access to the community and is striving to complete these projects in early 2019, weather permitting. Montecito Creek Bridge (PM 8.12): Construction continues seven days a week from 7 am until 6 pm, weather permitting to maintain the integrity of the construction site and surrounding area during the rainy season. This bridge is expected to re-open to traffic with some restrictions by July. Romero Canyon Creek Bridge (PM 10.92): Structural work has been completed with roadway and utility work continuing. This bridge is expected re-open to traffic by mid-February. Project completion is anticipated by the end of March. The Toro Creek Bridge (PM 12.14): Bridge rails have been poured on one side of the bridge with the other side to be poured following the relocation of water lines this month. Roadway and utility work is ongoing. This bridge remains open with one-way reversing traffic control until project completion. The water lines are currently being relocated with completion anticipated by end of this month. All lanes of this bridge are expected to re-open in June. Toro Canyon Creek Bridge (PM 12.49): Structural work has been completed. Roadway and utility work is ongoing. This bridge is expected to be re-opened to traffic by mid-February with project completion expected by the end of March. Security Paving of Sylmar is the contractor for the $20 million replacement of these bridges. Arroyo Paredon Bridge (PM 15.50): The precast bridge has been installed with the construction of the bridge railing and deck surface nearing completion. This bridge is expected to be re-open to traffic by mid-February. Lash Construction of Santa Barbara is the contractor for the $10 million replacement of this bridge. Project completion is expected by the end of March. Barricades and locked gates secure each location with detours available via local roads. Emergency responders will maintain access to these locked areas for public safety. A segment of State Route 192 is open to motorists but through traffic is strongly advised to continue using US 101. State Route 192 remains closed at multiple locations between Sycamore Canyon/Camino Viejo Road and Cravens Lane. Montecito would have been widened YEARS ago if people in the community hadn't raised holy heck. They made such a big deal out of it I guess Caltrans just gave up. It would have been finished some time ago and made a big difference in traffic tie-ups. Be careful what you wish for. You have a lot of faith in Caltrans. After watching the 101 widening project through Carpenteria, which will take longer than World War II to complete, I'm not that impressed. And we are not even talking about the stretch from Carpenteria through Montecito. Remember that it took them many days to even start clearing the 101 after Jan 9 to restore capacity to a major transportation artery. The only project I checked on, the Micheltorena overpass job, was over schedule and over budget but Caltrans said they didn't penalize the contractor because they didn't want to end up in court. So that contractor was allowed to bid on other Caltrans projects. The projects were won by "qualified" bidders on time & materials, overhead rates, and profit, and probably with incentives for performance (completion milestones) on "not to exceed" prices, Caltrans is pretty good at contracting and the contractors are pretty good at constructing. I wanted to make the point that these jobs are not bid jobs. They are time and material. The max amount paid to contractors are these totals listed. They are all way under this amount for these projects.